This is a film I’ve wanted to see since I first heard the concept last year. Nazi zombies: how can anyone turn down a pitch like that? That’s B-movie heaven, man. Anyone who’d turn down the chance to watch zombies, let alone Nazi zombies, get killed possesses questionable tastes indeed. The film is pure shlock, and is shameless and unapologetic about it. The basic concept is: Nazi zombies hunt down a group of medical students on vacation- in a cabin in the mountains, of course. Simple and elegant. The characters even do us the courtesy of pointing out the cliches in their own story: ‘how many movies have characters going to a cabin in the woods, without cell phone reception’, is one of the questions actually posed by a character. So the film is assuredly tongue-in-cheek. It’s pretty funny, actually, which is great because pretentiousness in a horror film is a bad trait. Now, I haven’t seen Evil Dead 2, but my friend has pointed out the consistent references to this in Dead Snow: the improvised use of a chainsaw, specific shots and camera moves, etc. So the filmmakers were obviously going for the ‘self-referential spoof’ tone here, which is encouraging. However, the film seems to get off to a slow start. I know, I know, character development is important. Still, this is a horror movie with Nazi zombies: I don’t need every character exquisitely drawn out. Of course, even the attempts at character development are based on cliched dialogue and character types, and none of it is taken seriously, so why am I complaining? I guess, while I had fun watching the movie, I wish it had been a little more serious. Amidst all the dismemberment and head-smashing and gore I wonder why a little more melancholy couldn’t be inserted into the proceedings. I didn’t really care when the victims got killed- except for the motor skier who has to climb a cliff using zombie intestines for rope, but I only felt bad for him because he’d already been through a lot of crap. The other deaths seem perfunctory, and I wish they hadn’t killed everybody. I’m a sap, though, and sort of a wuss when it comes to movie deaths. The film is undeniably fun to watch, and fans of the genre will revel in the gore. There are some good scares along the way, too. 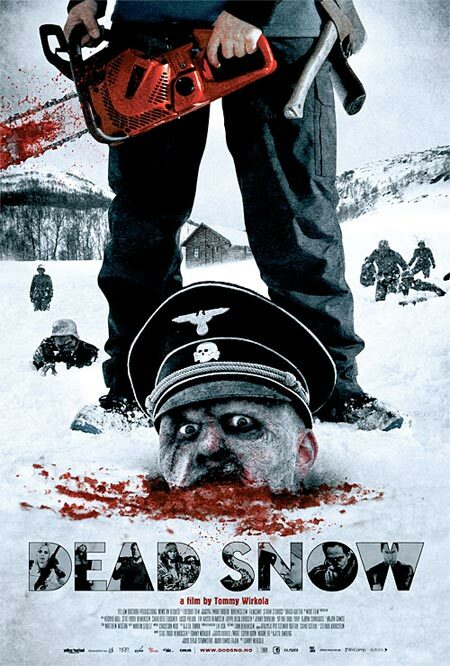 So, I can recommend Dead Snow.